Global technology powerhouse Siemens plans to boost its digital presence in the Middle East region with investments worth $500 million over the next three years. Among these investments are the MindSphere Application Centers with two planned in the UAE, said a senior company official at the Siemens Innovation Day held today (April 15) in partnership with Expo 2020 Dubai and Dubai Electricity and Water Authority (Dewa).. The German company is committed to setting up 20 of these MindSphere Application Centers in 17 countries, stated the official. Each of the centers spans multiple locations in different countries and specializes in a particular industry in which Siemens is active. At these centers, around 900 software developers, data specialists and engineers work together with Siemens customers to develop digital innovations for data analysis and machine learning. These new solutions are being developed on MindSphere, Siemens’ open, cloud-based operating system for the Internet of Things (IoT). In the UAE, the two new centers will be located in Dubai and Abu Dhabi. The MindSphere Application Center in Dubai will handle airports, logistics and cargo to co-develop innovative approaches that improve the movement of people and goods. The center will optimize the efficiency of logistics by leveraging advanced analytics and IoT solutions provided by Siemens. The other center in Abu Dhabi will cater to process industries, mainly focusing on oil and gas, water and waste water, enabling customers to improve operational efficiency and reduce their costs across the whole value chain. In addition, Siemens is investing in software grants aimed at boosting digital skills among youth in the region; establishing a hydrogen economy with the aforementioned partners; and helping create the most connected expo ever using the MindSphere system. “The Internet of Things has arrived and is set to transform industries and cities. However, many companies are still in the early stages of adopting digital strategies and incorporating them into their business models,” said Roland Busch, the chief technology officer and member of the managing board of Siemens AG. 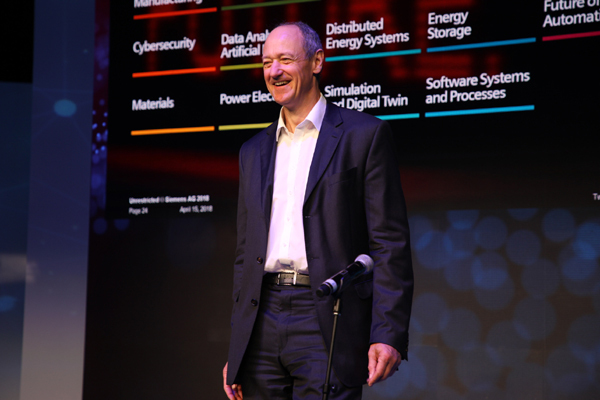 “Siemens has reinvented itself into one of the world’s top 10 software companies and is continuing to expand its digital capabilities. We see vast potential for the adoption of digital technologies in the Middle East and want to support the region’s transformation in various ways, ranging from youth development to setting up our MindSphere Application Centers,” he added. On the co-creation front, Siemens and Dubai are jointly developing new uses for disruptive technologies. As the Premier Partner for Intelligent Infrastructure & Operations, enabled and digitalized by the IoT operating system MindSphere, Siemens is supporting Dubai’s ambitions to create the most connected Expo ever with digitalization. With MindSphere at the heart of this partnership, the parties are working closely to create a very unique exposition, in line with Dubai’s aspiration to become the smartest city in the world. In co-operation with Dewa and Expo 2020 Dubai, the three parties have taken the first steps to develop a green hydrogen economy in the UAE. In February this year, the entities signed a deal to kick-off a pilot project for the region’s first solar-driven hydrogen electrolysis facility. Planned to be located at Dewa’s outdoor testing facilities at the Mohammed bin Rashid Al Maktoum Solar Park in Dubai, the project would aim to test and showcase an integrated MW-scale plant to produce hydrogen using renewable energy from solar photovoltaic panels at the Solar Park, store the gas, and then deploy it for either re-electrification, transportation or other industrial uses. The use of hydrogen technologies has the potential to accelerate renewable energy integration and deployment in the region and pave the way for the transition to a sustainable and green economy in the UAE. Siemens is also providing software grants to university youth in the UAE, Egypt and Saudi Arabia. The grants seek to develop the skills required to drive the region’s digital transformation. Dietmar Siersdorfer, CEO of Siemens in the Middle East and UAE, said: "Countries in the Middle East are at different stages of development and we are supporting their current and future needs."